If you’ve ever met a grey jay, Perisoreus canadensis, then I think you’ll agree with me that this audacious and personable bird is one of the cutest corvids in the world. Like many corvids, these little birds invest most of their waking hours into preparing for a “rainy day” by seeking out and collecting food. 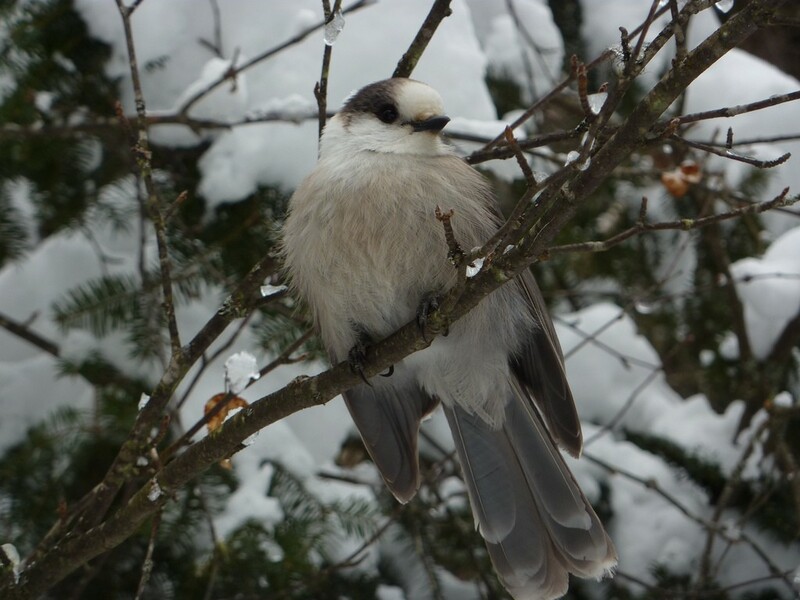 But grey jays experience more than the occasional rainy day: they are year-round residents of boreal and subalpine coniferous forests in North America, so they regularly deal with cold temperatures, high winds and deep snows that blanket their food supply for long periods of time. Grey jays are omnivorous, consuming (and caching) berries, insects, titbits of meat from carcasses along with a variety of food items stolen from campsites. But there is one item that is notably absent from grey jays’ daily menus; conifer seeds. In fact, these birds are neither capable of prying open nor extricating seeds from conifer cones. Further, grey jay population numbers do not fluctuate with the availability of seeds as is typical for conifer seed predators. Why are grey jays so intimately associated with coniferous forests when they don’t consume their seeds? Another interesting element to note is that grey jays cache perishable food items into cracks in tree bark during the summer and autumn months. 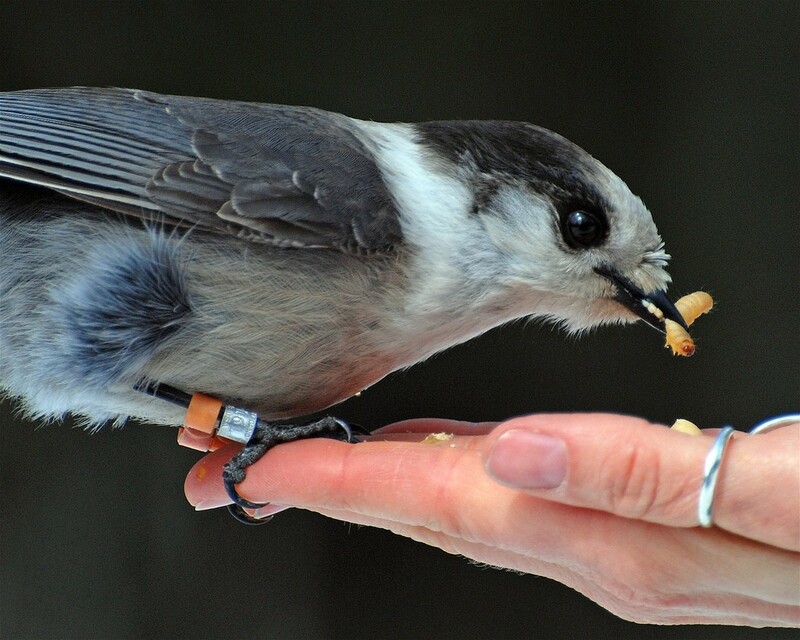 In fact, grey jays are the only bird species that we know about that routinely cache large amounts of perishable food items for long periods of time. How do these food items survive the warm summer months until the freezing temperatures of winter, when the birds consume their caches? 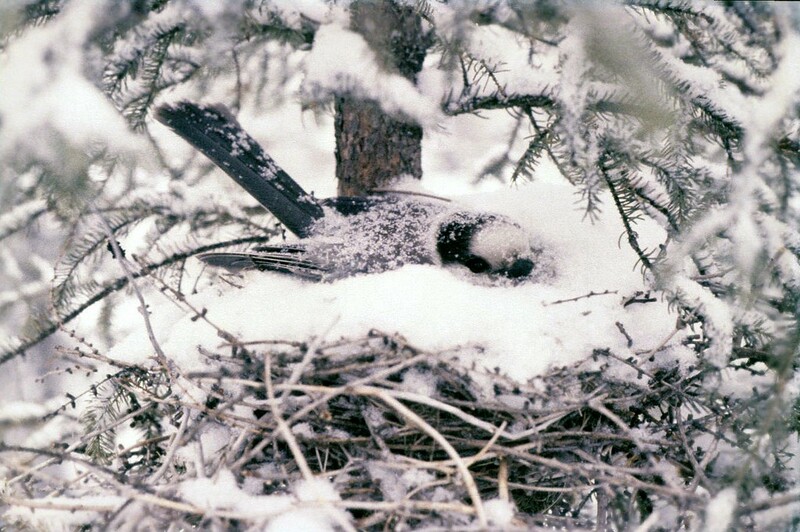 Contrary to what you might expect; these birds are not merely caching food so they can survive harsh winters: grey jays nest and raise their chicks in the dead of winter, too. “What is perhaps more remarkable is that female grey jays start breeding in mid-February when temperatures are routinely below minus 15 degrees Celsius and there is very little food around, so these caches are crucial not only for over-winter survival but also for successful reproduction,” says Ryan Norris, a professor in the Department of Integrative Biology at the University of Guelph, in Ontario, Canada. Several years ago, Dr Norris began working with Dan Strickland, retired chief park naturalist for Algonquin Park. Even though it wasn’t part of his job, for decades Mr Strickland devoted his spare time to studying the park’s jays; colour banding the birds in autumn and monitoring their nests and chicks in late winter. The birds became like family. Algonquin Park is located at the most southern portion of the grey jays’ natural range in the eastern part of North America. However, Mr Strickland had noticed that the grey jay population in Algonquin Park had declined noticeably since the 1970s. “When Dan and I do field research, Dan is always pointing out areas where jays used to be but haven’t been used [as territories] for decades,” says Dr Norris in email. 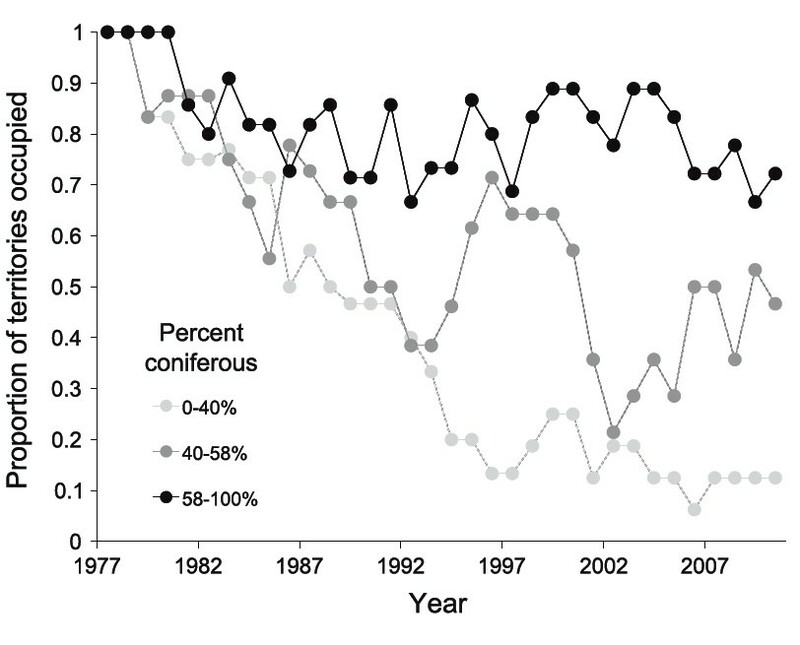 Mr Kielstra’s data show that grey jays abandoned territories with lower proportions of conifers and they abandoned those territories at faster rates over time. 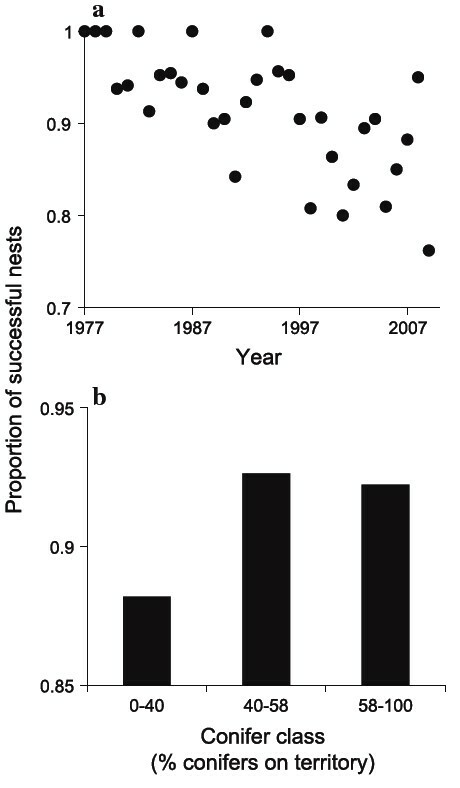 They found that the proportion of successful grey jay nests was related to both the year (1977–2009) when the birds nested (figure 2a) and to the percentage of conifers in their territory (figure 2b). But why are grey jays so dependent upon coniferous trees? The team did some brainstorming and identified several testable hypotheses. Knowing that these birds are so critically dependent upon their food caches, the most obvious hypothesis was that conifer trees are linked to the jays’ ability to successfully cache adequate amounts of food for winter. But what is it about coniferous trees that makes them so important for jay food caches? Is it just coniferous trees in general, or are some coniferous species more important than others? Knowing these answers could provide the team with more clues. Previous research had shown that most conifer trees defend themselves from the nibbling attentions of herbivores, particularly hares and deer, by growing thick bark and by producing toxic resins. Knowing that useful food storage sites are dependent upon the physical characteristics of both birds and bark was an important consideration. 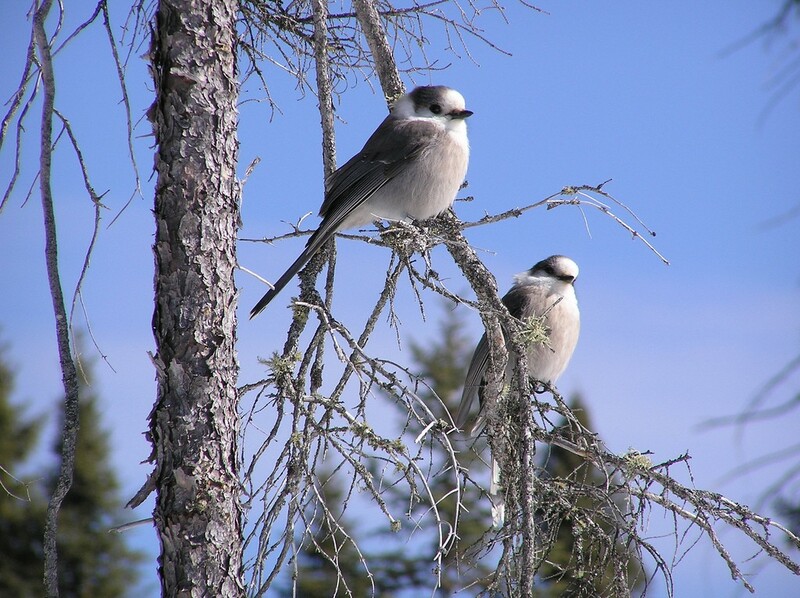 For example, even though balsam fir, aspens, and young white pine are present in the grey jays’ territories, their smooth-barked trunks and branches provide the jays few food storage opportunities. In contrast, sugar maple and older white pine have rough bark but their surfaces are so tough that a little bird with a small beak would not be physically capable of prying up the bark to hide a morsel of food underneath. But what about spruce trees? The team realised that spruce could be indicators of territory quality: their data seemed to suggest that higher quality grey jay territory had a greater proportion of black and white spruce, Picea mariana and P. glauca. Additionally, spruce produce toxic resins that could act as a food preservative. Further, spruce growing in the resource-limited boreal (where grey jays are more numerous) produce more toxic resins than do more spruce growing at more southerly locations, such as Algonquin Park. Perhaps the jays were relying upon toxic spruce resins as a preservative for their cached food? Later, they went back to recover the cached food items and weighed them to identify which tree species was best at preserving them. “Consistent with the hypothesis, we found that coniferous trees were much better at preserving cached food”, says Dr Norris. The team found that the proportion of original weight lost by the food items varied depending both upon the species of trees they were stored on and the length of time stored: spruce showed the least percentage of weight loss for most items stored (here’s a larger view of these data shown above). Different cached food items also showed differences in weight loss. 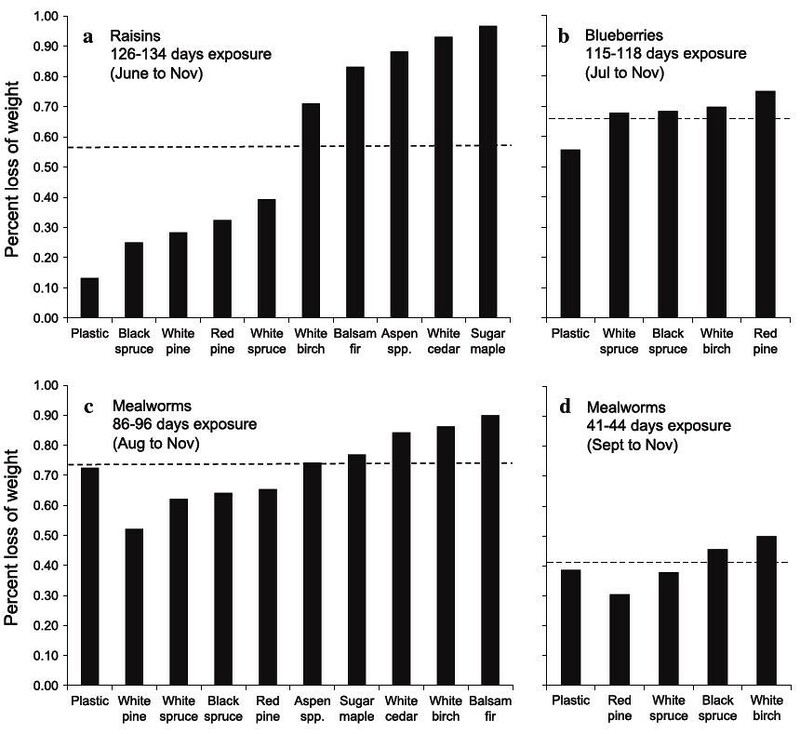 As you can see in the above figure, weight loss was highest in blueberries after 115–188 days of exposure, lower in raisins after 126–134 days of exposure, and lowest in mealworms after 41–44 days of exposure. These data clearly show that different trees are better at storing food for long periods of time. The team also saw differences in the jays’ reproductive success between habitats: lower quality habitat meant they were less successful at fledging young. Previous research indicates that warmer autumn temperatures associated with global warming could result in increased rotting of the jays’ food stores (doi:10.1098/rspb.2006.3667). Low-quality food could compromise the physical condition of the adult birds during the winter and also reduce their ability to adequately feed their hungry nestlings. This study could help scientists better understand range limits for other animals, particularly for other animals that breed in areas with extreme weather conditions. Grey jay (Perisoreus canadensis), sits in one of his conifer trees in Algonquin Park, Canada. (Cerdit: Ryan Norris / doi:10.1007/s00442–011–2040-y). Enjoy my writing? Please click on the green heart in the left corner to recommend this piece. Follow me on Medium for more like this. Originally published at The Guardian on 14 October 2011.